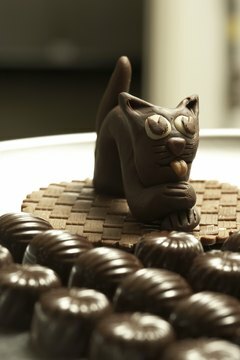 Cats and chocolate do not go together. Pets and chocolate are a dangerous combination. Chocolate is even more dangerous to cats than dogs due to their relatively small size. Pet owners should be aware of the danger of chocolate and what to do if your cat eats it. Chocolate is dangerous to pets for several reasons. Chocolate contains theobromine, a stimulant. Humans can metabolize theobromine relatively quickly, but dogs and cats can't, making it toxic and dangerous. If your cat eats chocolate, the theobromine basically acts like a stimulant overdose. If your cat eats any kind of chocolate, you should consult your veterinarian. However, different types of chocolate have differing levels of theobromine, and you should take note of what kind of chocolate your cat ate. Baker's chocolate is the most dangerous, followed by semi-sweet and milk chocolate. Dark chocolate varies considerably, with the more expensive varieties being almost as dangerous as baker's chocolate. You should always make a note of exactly what kind chocolate your pet ingested. In case you did not catch your cat in the act of eating chocolate, you should be aware of the symptoms of chocolate poisoning. If your cat eats chocolate, you can expect to see a wide variety of reactions, including extreme excitability/irritability, vomiting, diarrhea, increased heart rate, muscle spasms/tremors and even seizures. If you know or suspect that your pet has eaten chocolate, you should immediately consult a veterinarian. Often, if your cat has eaten the chocolate in the last few hours, the vet will recommend inducing vomiting. In any situation, you will most likely want to bring your pet in to a veterinarian for further treatment. Is Febreze Dangerous to Cats?